Communication Essentials for Financial Planners tackles the counseling side of practice to help financial planners build more productive client relationships. CFP Board’s third book and first in the Financial Planning Series, Communication Essentials will help you learn how to relate to clients on a more fundamental level, and go beyond "hearing" their words to really listen and ultimately respond to what they're saying. Expert coverage of body language, active listening, linguistic signals, and more, all based upon academic theory. There is also an accompanied set of videos that showcase both good and bad communication and counseling within a financial planning context. By merging written and experiential learning supplemented by practice assignments, this book provides an ideal resource for any client-facing financial professional as well as any student on their pathway to CFP® certification. Counseling is a central part of a financial planner's practice, and attention to interpersonal communication goes a long way toward progressing in the field; this guide provides practical instruction on the proven techniques that make a good financial planner great. The modern financial planning practice is more than just mathematics and statistical analysis—at its heart, it is based on trust, communication, and commitment. While interpersonal skills have always been a critical ingredient for success, only recently has this aspect been given the weight it deserves with its incorporation into the certification process. Communication Essentials for Financial Planners provides gold-standard guidance for certification and beyond. JOHN E. GRABLE, PHD, CFP®, holds an AthleticAssociation Endowed Professorship at the University of Georgia (UGA), where he conducts research and teaches financial planning. JOSEPH W. GOETZ, PHD, is an associate professor of financial planning at UGA and co-founder of the ASPIRE Clinic and Elwood & Goetz Wealth Advisory Group. CHARLES R. CHAFFIN, EdD, is Director of Academic Home, CFP Board Center for Financial Planning, where he oversees all initiatives related to academic research, teaching pedagogy, and building the body of knowledge for financial planning. CERTIFIED FINANCIAL PLANNER BOARD OF STANDARDS, INC. (CFP BOARD) is an initiativeto create a more diverse and sustainablefinancial planning profession so that every American has access to competent andethical financial planning advice. The Center brings together CFP® professionals, firms, educators, researchers and experts to address profession-wide challenges in the areas of diversity and workforce development, and to build an academic home that offers opportunities for conducting and publishing new research that adds to the financial planning body of knowledge. More about the Center and its initiatives can be found at www.CenterforFinancialPlanning.org. Names: Grable, John E., author. | Goetz, Joseph W. (Professor of financial planning), author. 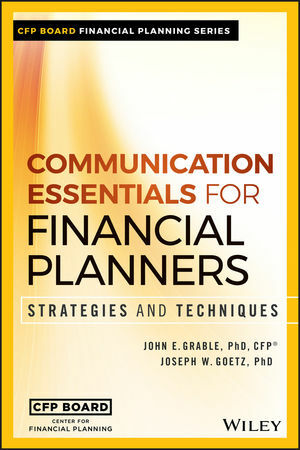 Title: Communication essentials for financial planners : strategies and techniques / John E. Grable, Joseph W. Goetz. Subjects: LCSH: Financial planners. | Interpersonal communication. | Interpersonal relations. | Investment advisor-client relationships.